But the true power of the xDB is collecting data that is important to your organization. What videos did a user view, how long did they watch the video, what colors did the user visit the most in leather couches. To create a single node facet it takes a few simple steps. Add an entry to your contact's record. 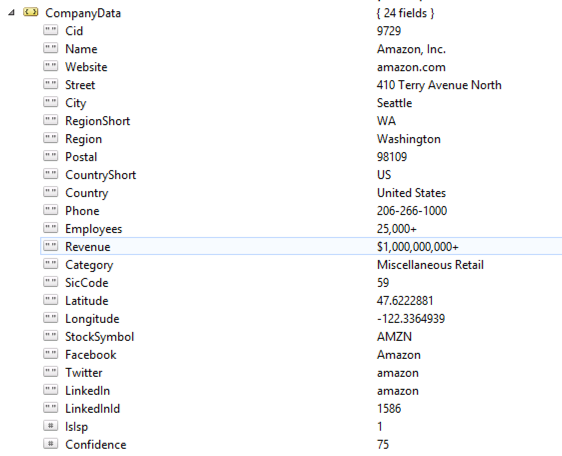 For our example we are going to use an example of capturing company contact information we are getting from a customer. The interface is a simple interface, just make sure it inherits from IFacet. Next create a serializable concrete model of your interface inheriting from Facet and your interface. At this point Sitecore knows our facet called CompanyData. And it knows it is based on our interface ICustomerLookup. All we need to do is get the facet from the user's tracker and push data into it. Thats it. Reading the data is as simple as putting the data in. Just get the facet off the Tracker by name/Interface. This is persistent data for the contact. As soon as the user's session ends, the data is pushed into xDB. When the user visits the website again, the data is pulled from xDB and pushed into the users Tracker again. So its always available.